Our culture is famously ordered along commercial lines. We work, we earn, we spend, we spend until the card maxes out. Though there need not necessarily be any conflict between a free economy and the practice of the faith, many find Mammon to be a formidable foe. Trained and skilled as physicians, they received from the Holy Spirit the gift of healing people’s illnesses of body and soul by the power of prayer. They even treated animals [you gotta love these guys!]. With fervent love for both God and neighbor, they never took payment for their services. They strictly observed the command of our Lord Jesus Christ, “Freely have you received, freely give” (Matt. 10:8). The fame of Sts. Cosmas and Damian spread throughout all the surrounding region, and people called them unmercenary physicians. I still find people to be generous – indeed the U.S. is historically the most generous nation on earth. And, more interestingly still, the great state of Mississippi’s citizens (the poorest in America) give a larger portion of their income to charity than any other. Where we frequently fail, is to have the time to give to anything. We also work more hours than any other nation with the least amount of time taken for vacation. Then our lives become entangled in activities to where there is little time to notice the needs around us, much less practice the unmercenary faith we have inherited. I wanted to go somewhere on my day off this week to just sit and be around people – sort of a hunger for a village. We have few villages other than those places people congregate in a hurry to spend money. Something is wrong in how we have configured our lives. Unmercenary living includes time given that I do not expect to get paid for. Creating the time and space where human beings are able to meet and speak and live life face-to-face is perhaps one of our most desperate needs of all. My first living experience in a suburb back in 1980 introduced me to the faceless neighbor. The neighbors across the street from us were new. We took cookies when they moved in. It was the last time we ever got a chance to speak. Shortly thereafter a garage door was opener was installed, and the fortress was complete. Arriving home, “up!” the door would swing. “Down” it would go. Even on weekends, “Up” the door would swing. “”Out” the riding lawnmower would appear with rider intact. Lawn mowed, “In” goes the mower, “Down” comes the door. Each man with his castle. 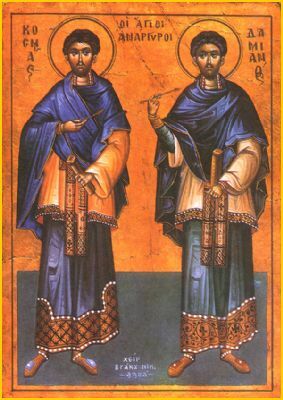 May the holy unmercenary Physicians Cosmas and Damian pray for us. May our doors to one another stay open. This entry was posted on October 31, 2006 at 10:39 am and is filed under Orthodox. You can follow any responses to this entry through the RSS 2.0 feed. You can leave a response, or trackback from your own site. What happened to the St. Simon quote? I was just reading it, left your site for a minute and when I came back it was gone??? It’s a quote from St. Isaac of Syria, and will go up tomorrow morning. Sorry. I’m still learning my dashboard. Your blog serves as an act of unmercenary living: perhaps a place where some of the people living in fortresses can venture out and meet and speak and trust (or learn to trust again).